Summary: For much of her life, Anne Morrow, the shy daughter of the U.S. ambassador to Mexico, has stood in the shadows of those around her, including her millionaire father and vibrant older sister, who often steals the spotlight. Then Anne, a college senior with hidden literary aspirations, travels to Mexico City to spend Christmas with her family. There she meets Colonel Charles Lindbergh, fresh off his celebrated 1927 solo flight across the Atlantic. Enthralled by Charles’s assurance and fame, Anne is certain the aviator has scarcely noticed her. But she is wrong. For the month of July, my book club decided to read THE AVIATOR'S WIFE by Melanie Benjamin along with GIFT OF THE SEA by Anne Morrow Lindbergh. I actually really liked this pick because the idea of reading of a historical fiction book along with a book of essays that was actually written by the main character was something a little different for us. Plus, I had intended on reading both books, but I needed a little kick in the pants to actually make that happen. THE AVIATOR'S WIFE is a fictional account of Anne Morrow Lindbergh, Charles Lindbergh's wife. I admit that I knew very little about the couple outside of Lindbergh's historic flight and the kidnapping of their first child, and I was somewhat familiar with her most famous book GIFT OF THE SEA after taking a MOMS class at the local church. But beyond those things, I really had no idea of her life or her accomplishments. As a result, I really enjoyed THE AVIATOR'S WIFE. Anne was an amazing woman to say the least, and I couldn't help but like her in the way Ms. Benjamin portrayed her. Not only was did she marry the most famous man in the world (which was not an easy thing), but she also was a loving mother and grandmother despite the tragedy that occurred with her firstborn. Furthermore, she was an accomplished aviatrix in her own right -- she was the first licensed female glider pilot in the U.S; and she traveled around the world at her husband's side up to the time she started having children. It seemed to me like Anne was an extremely tough woman -- and by that, I mean physically and emotionally. What I didn't know about the Lindberghs was how impossible Charles was. It didn't surprise me that he had an ego -- you almost need to be full of yourself to even try to fly across the Atlantic by yourself. And I wasn't exactly blown away by how he treated his wife (although it was sad, and at times, difficult to read.) However, I was surprised by his anti-Semitic views and his outspokenness on those issues; and I was shocked to learn that he fathered children to three other women besides Anne. There is no doubt that THE AVIATOR'S WIFE is a fascinating book for those readers who aren't familiar with the Lindberghs. It was obvious to me that Ms. Benjamin did her research and really tried to incorporate all of the factual accounts into her fictional portrayal. However, this book was also good for many other reasons. One of the things I appreciated the most about this novel was Ms. Benjamin's writing. I thought her dialogue was spot-on and I liked how she described the various settings. Furthermore, she did an amazing job of making Anne a believable character. It's difficult to understand how she tolerated Charles for so long; however, the author showed Anne's inner strength and her ability to discover her own needs and passions. THE AVIATOR'S WIFE was a fantastic book club selection... especially in concert with reading GIFT FROM THE SEA. My group wasn't entire sure after reading the two books that THE AVIATOR'S WIFE had the same feel/voice as GIFT FROM THE SEA, but it didn't stop us from appreciating both books. There is a formal reading guide with 20 questions, but we had so much to say that we didn't really use it at all. Some of the themes you might want to explore include: love, family, loss, grief, fame, insecurity, the definition of a hero, memory, legacy, forgiveness and redemption. 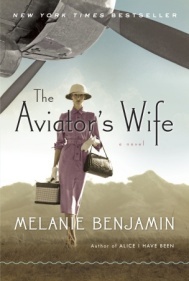 THE AVIATOR'S WIFE is a terrific example of quality historical fiction. Highly recommended to fans of historical fiction or anyone who wants to learn more about Anne Morrow Lindbergh. I enjoyed your interview. What bookclub sounds just as talkative as mine is. It's also nice when a book is so interesting that you can discuss it without referring to the discussion topic. I reviewed this book on my blog a while back. If you're interested you can check out my review. I have been wanting to read Aviator's Wife since it came out. Like you, I'll be going into the book not knowing very much about the couple. I hope I don't end up hating Lindbergh. I do know that he was a scumbag and some even think he was in on the kidnap of his son (he had even "staged" a kidnap months earlier as a "joke"). I can't even read about his wife because I hate him too much! I listened to this book and just loved it and I generally don't enjoy historical fiction.